Today I am grateful for Creepers! Creepers are such versatile plants that we use to cover unattractive walls and spaces and for vertical interest. I love watching the Star Jasmine in my garden as it fills the wallss and emits its heady perfume. I enjoy the challenge of getting my two small Clematis plants to grow and I love watching the Pandoea jasminoides (Bouwer vine) slowly fill up the trellises around the pool. My newest creepers are Jasminum polyanthum – the rate at which these creepers are growing up their trellises is quite remarkable. For these and all the other creepers in my garden, I am grateful. Photo: Pandorea jasminoides “Charisma” -I love these creepers that are planted against the wall around our swimming pool. They are growing at a steady rate (not very fast) and up until now I’ve mostly enjoyed the variegated foliage as they have not flowered profusely. I am looking forward to seeing them in full flower which I’m hoping will happen soon – so far this season we already have more flowers on them than in previous years. Pandorea jasminoides “Charisma” – Evergreen twining branches hold glossy bright green leaves with cream edging creating a perfect background for the flowers. 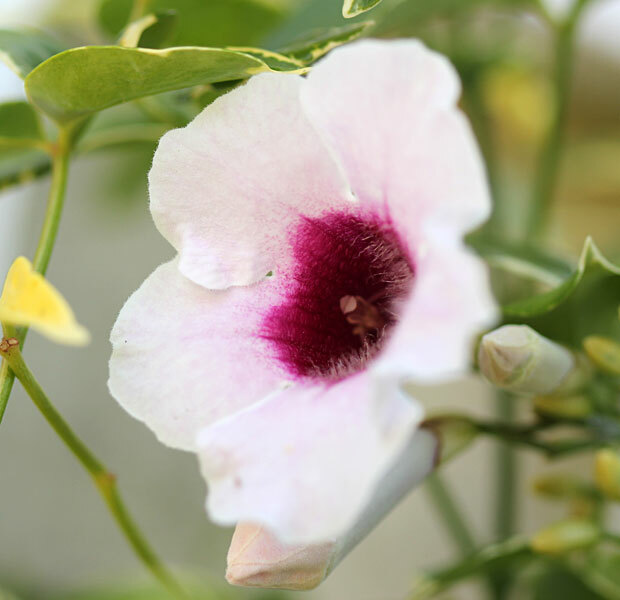 Soft pink trumpet-shaped blooms have rosy purple throats for a lovely effect. Grow on a trellis to cover walls or fences.